Looks like it's time to get hunting again. 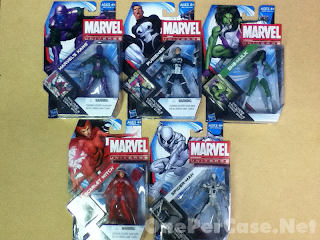 The latest wave of Marvel Universe is starting to show up now. 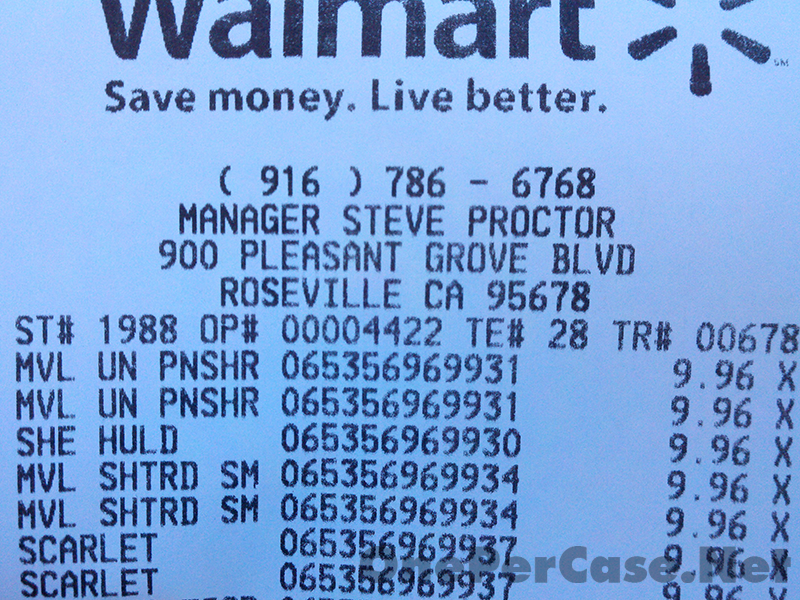 Onepercase's own Jason found the whole wave at Wal-Mart this morning. 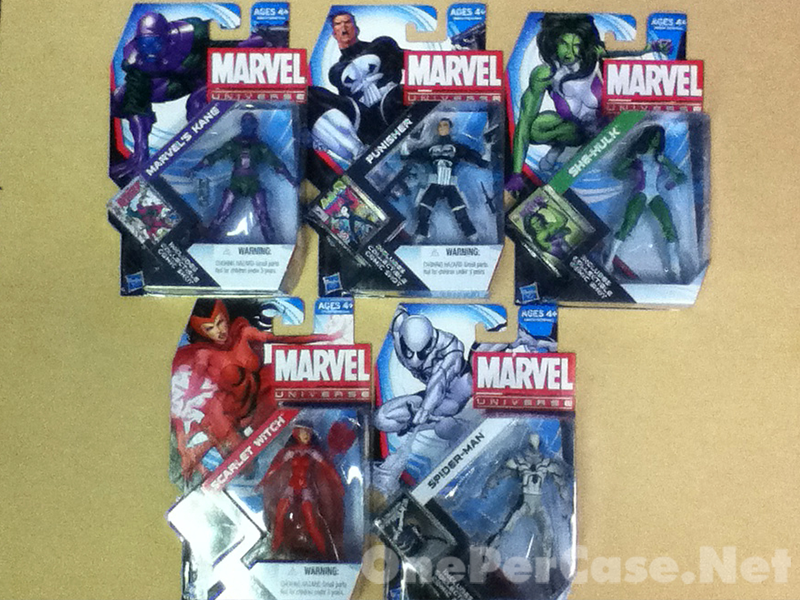 This particular case contained the Future Foundation version of Spider-Man, as well as Kang, the new Punisher, Scarlet Witch and She-Hulk. Good to see new stuff showing up! Sorry about the phone camera quality pictures, but needless to say, reviews will be coming soon. 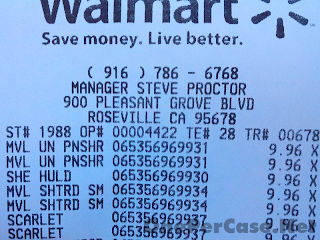 Oh, and for the doubters, click on the jump for a picture of the receipt. Nice find, but damn this is frustrating for me as my only local Wal-mart is not going to reward me like this as they took down the pegs for ML and MU when they did the recent reset to fill the space with....Bakugan... O_O Fuuuuuu.....!!!! Too bad my local Wally just put out another case of the Red Hulk/Ronin wave on Wednesday! Same here-- my local Walmart has purged all NON-MOVIE Marvel product. So, time to venture online or wait (eons) for the local TRU to catch-up. Well, if you haven't gotten this or the previous wave, Marvel Universe 2012 Series 02 Revision 02 is actually a pretty good case assortment. It has one each of this wave, the previous (Beta Ray Bill) wave, and a Colossus and Juggernaut. Might be two figure you already have, but nowadays, that's a pretty solid case. BBTS has it up for pre-order at http://www.bigbadtoystore.com/bbts/product.aspx?product=HAS22083&mode=retail and it's supposed to show up in September, which is now only a few days away.